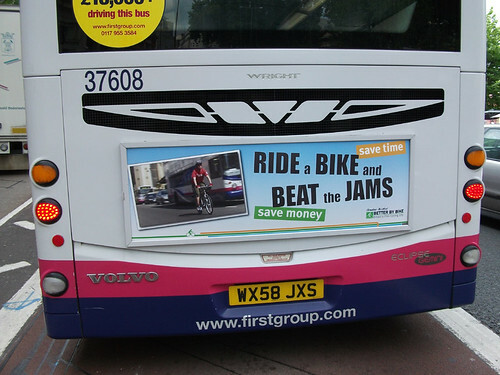 As I mentioned previously, I was invited to meet with First Buses South East and Central Scotland. I was invited as I was unfortunate enough to have had an incident with one of their buses during a commute home. The meeting was arranged well in advance but I was a little in the dark about what exactly it would entail. I knew we would discuss my incident, but I wasn't sure what else. However, as I was due to meet with the managing director Paul Thomas and the training manager Mike Wilson, I hoped that the meeting would go a little further. Therefore I prepared a little. First Bus have the right idea here! So armed with a number of things to discuss, including campaigns that First might consider being involved in, a number of issues that cyclists had raised on my blog and via twitter, and a lot of curiosity about the training that First provide for their drivers, I made my way to their depot and training centre in Livinston. As I arrived a little early Paul was not there yet, however I was quickly introduced to Mike Wilson. Straight away I was put at my ease, as Mike was very welcoming and seemed genuinely interested to see me, and hear about my filming, especially what equipment I use to do it. Mike it turned out started off as a paramedic motorcycle rider, and then moved on to work with the police. His job with the police was to train police drivers and to inspect and conduct driver examinations. It was after meeting with First Bus about 6 years ago that he was offered a job with First Buses. The aim, was to bring the standards of driver training that are expected in the police to bus drivers. For the last 5 years he has been trying to change the standard of bus driving for the better. Mike explained how they were using a number of techniques to improve driver training. One system that had made a big difference was the introduction of Green Road. I was given a excellent demonstration of how Green Road works by Graeme (otherwise known as Trigger!). The system is a GPS system that records the diving habits of the companies drivers that can be reviewed later. It records any unusual driving, such as fast cornering, hard braking etc. These 'incidents' are recorded using a traffic light system, with red being something out of the ordinary. Drivers also get instant (delayed 3 seconds) input on their driving, so that they know if they are hitting amber or red. There are incentives to keep the system in the green with further incentives for improved drivers. I was also shown some of the training materials that they use. They base the training on the Smith system. Something that I had not heard of before, although a lot of the material made sense. Planning well ahead, making space for yourself etc. Another technique that they use are the mystery passengers. They routinely hop on buses to watch driving real time. Obviously they cannot have mystery passengers on every bus, but they can respond (in some cases within minutes) to customer complaints and Green Road information. Any driver who is failing in any way is brought back for training or other help. One thing that was nice to hear is that they do look 'around' the problem. If a driver has been great for 10 years, and suddenly drops in standard, it suggests that there is a problem, possibly even outside work. They try and get to the bottom of the issue to help the driver instead of just treating the driving. A good approach I feel. Paul re-iterated much of what Paul had said to me, whilst explaining that he felt that the incident I had deserved more than just a standard letter. In fact at this point we discussed the standard letter. I pointed out that it can often feel like a fob off when you receive one. It rarely answers any of the issues raised by the complainer. It is understandably difficult, considering the issues surrounding confidentiality. However, Paul did note this and suggested he would look into it. Getting back to my complaint they also agreed with me that the driver should have driven better, i.e. should have hung back. They also agreed that the cycle lane was of very poor design and is contributory in this particular incident. I asked if they would back me if I was to bring up the issues I have with this particular cycle lane, and whilst they did not jump at the chance, they did suggest that they agreed that the overall design of that road could be improved. They suggested they could help me pursue a site visit with the council. Something I will certainly pursue. I then started mentioning some of the other campaigns that they might consider being involved in. I mentioned my Celebration Stations idea, and they agreed that this sounded good and they would be happy to be involved (training buses for cyclists to sit in to see blind spots, for example). They were already aware and looking into the Spokes/Lothian buses campaign. I also mentioned cycle training for drivers. This is where Paul mentioned that they are in the process of introducing the Cycle to Work Scheme (Cyclescheme). That sounded like a step in the right direction. However, I asked if they would consider integrating some form of cycle training with that, even if only to encourage more employees to cycle. For example that could be as simple as led rides for those considering cycling, or more advanced cycle training sessions. Again the idea didn't get anyone jumping out of seats in excitement, but it wasn't a lead bomb either. Perhaps if anyone knows what is available I could pass details on. After all of this, and Mike passed me his contact details (you will be hearing from me shortly!!) I went off with Trigger to see the Green Road system, and to........drive a bus! Yes, I did get to drive a bus. A real one, not a simulator. No, don't worry, it wasn't on open roads. Just in the training yard. I also only managed to go forward and backwards. Unfortunately time was too short to do anything else. Although the driving was limited it was still an eye-opener. Visibility is terrible! Not only the well documented blind spots. It's the ones created by the door supports, the mirrors (getting in the way! ), etc. Every cyclist should have a go at sitting in a bus cab. So, overall I was very impressed with my visit to First in Livingston. I was made very welcome, and I was very impressed with the attitude to safety. Of course that doesn't mean everything is perfect. It isn't, there are still incidents on the roads. But, maybe, just maybe, with a little collaboration between different groups of road users we can make our roads a safer and happier place to be for everyone. Sounds like it was a great interaction! Excellent post, sounds like it was a rather informative meeting! Interesting on the systems they use to monitor drivers and looking at other circumstances that could effect the driver is good to hear. Best of luck with how this going forward! What is this about "I considered cycling there, but not wanting to sit through a meeting in sweaty Lycra I decided to drive"? As for the cycle training, drop me an e-mail and I can put you in touch with a few qualified cycle trainers. Sounds great, anything which you can get them involved in will also be a bonus! I do love the experiences you can get yourself into with using a video camera. Great work Magnatom. It's great to hear of a company being so willing to engage in discussion. There's always the risk when a complaint is made that they will circle the wagons and blindly defend themselves. But the fact that you have made it clear that your concern is not the punishment of one individual but the safety of all road users obviously puts them at ease. And they are obviously pretty sensible people to begin with. I hope the ideas you discussed come to fruition. Looks really good. I have had some issues with a small number of First Bus drivers recently, so it's really good to see this. What a great post! I like that even considering the subject matter, it is written with a balanced view.